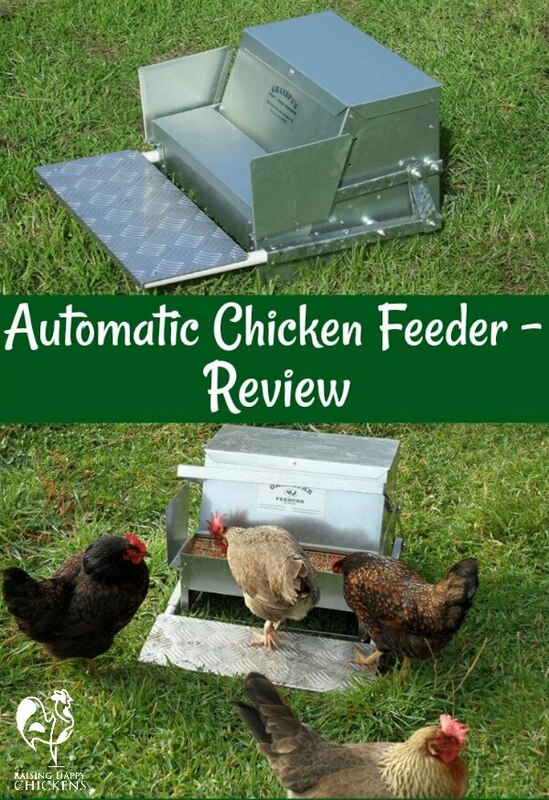 A review of the best automatic chicken feeder on the market. 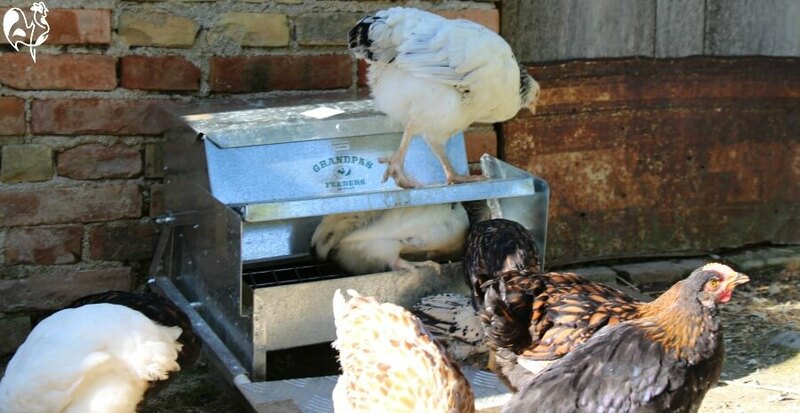 Why Grandpa's is the best automatic chicken feeder on the market. And by the time I realised I had a problem, I had no fewer than three rats' nests. It's a common complaint by non-chicken owners about people who keep chickens - they attract rats. Except - it's not the chickens who attract rats - it's the grain. So it wasn't surprising that I ended up with a huge rodent problem. I did my research, which told me the time for providing grain-fests for rodents had to end. 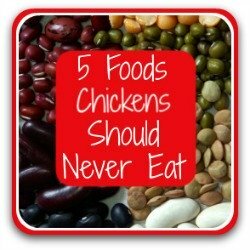 Rats can bring disease to the chicken house, not to mention to your family. 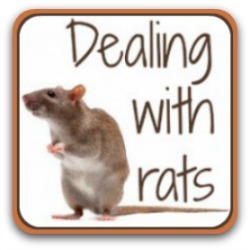 I decided there and then that first I had to get rid of the rats, and then I had to solve the problem long term. The open feeders had to go. So I invested in two things: an electronic rat trap and a Grandpa's feeder. And I have never looked back. Not had one single, solitary rat since. It's basically any type of feeder which leaves even a small amount of grain exposed. It doesn't have to be much - rats and mice can squeeze into the tiniest of holes. Some of the more recent designs for small flocks have a bucket or pipe, with openings at the bottom for chickens to peck from. Some are designed so that the chicken has to put its head inside, some are a tray. They all look good - but they're an open invitation to rodents. The one I used to have was like this one (mine had a lid). 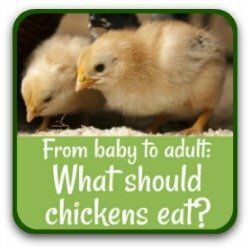 It's common to many backyard chicken keepers. 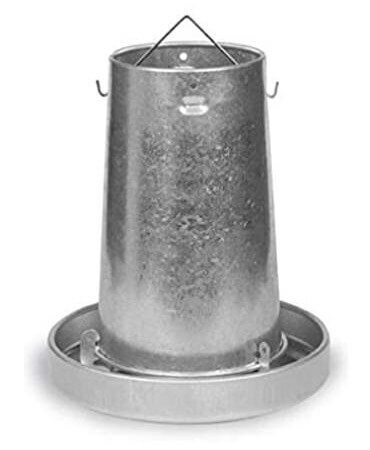 Made of galvanised steel, the feed goes into a round container and comes out in a pan at the bottom. As the chickens eat, the grain refills from the container. It can keep several chickens fed for several days. But, even when I hung it off the ground, mice and rats managed to get inside. They can get through the tiniest of holes. And they can jump. I opened the lid one morning to find a rat looking up at me from inside the drum. It was having its own private grain-fest. I did my research. The way to keep rodents and wild birds - who can bring disease to your flock - out of feeders is to have one that's completely enclosed. Grandpa's fitted the bill. It's been on the market for over 20 years - I got mine at a point where I had to order it from New Zealand! Now, thankfully, they sell via Amazon. It's waterproof, rodent-proof and predator-proof. In my view, it's the best on the market. (If you're convinced, and want to buy now, click on any of the pics on this page which will take you to Amazon. Or, keep reading for my full review and recommendation). The top of the hopper has a lid, and its edges cover over the sides of the feeder. 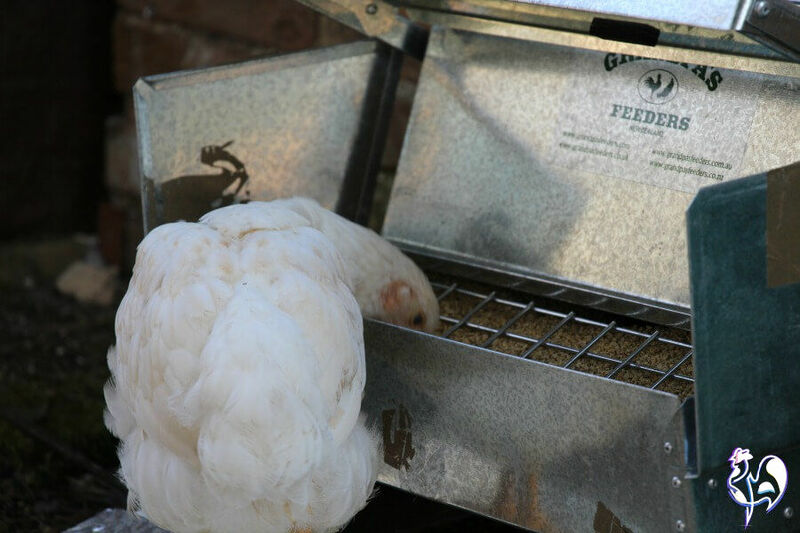 The front and back are held securely with pins which slot into holes on the feeder itself. Some animals - raccoons, for example - are adept at picking locks to get into the chicken run. They won't, though, get into this. 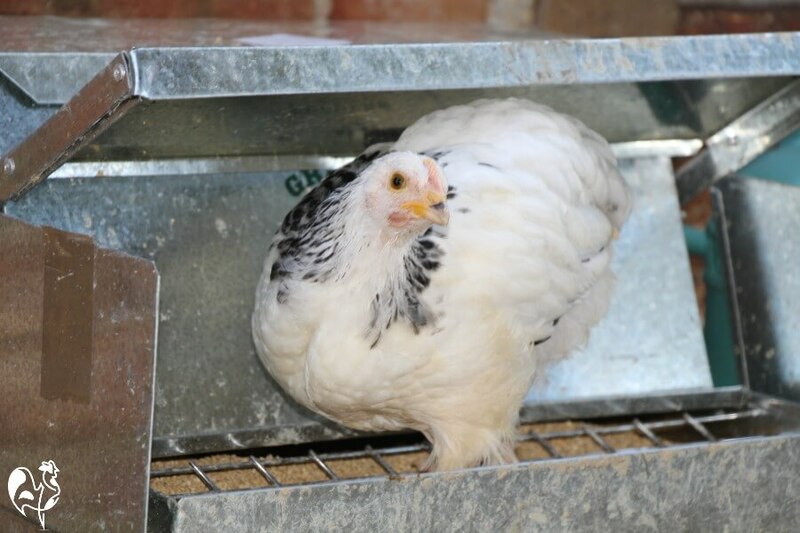 It also makes sure the top can't blow off and leave grain exposed to either rodents or to rain - both of them sure ways to bring disease to the chicken house. Click to buy from Amazon (affiliate link). ...and steps back off the platform. The lid closes until the next chicken arrives. The hopper has a sloped back, so there's never any grain stuck - it just naturally falls down into the feeding box. 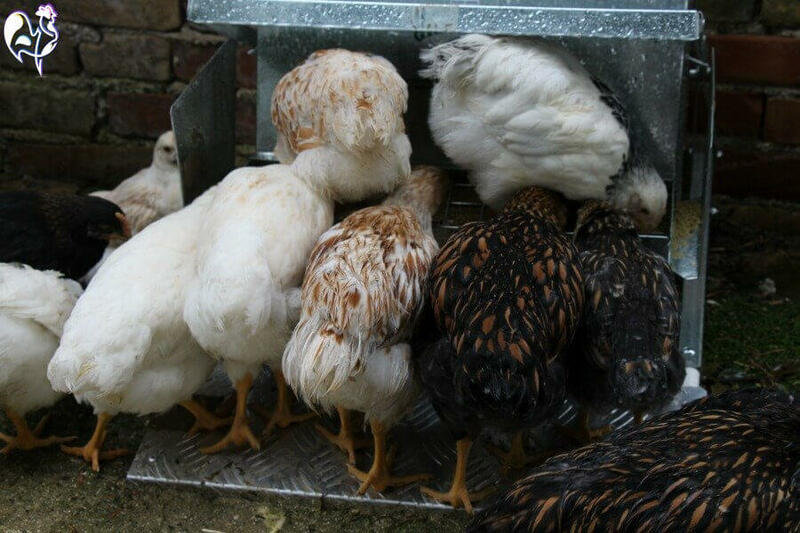 There's an anti-scratch bar inside, which stops the hens standing in the grain and scratching about, as they like to do. And there are side panels, which also prevents grain flopping over the side. Great addition - based on feedback from customers. So no grain goes on the ground. Don't you just love a company that listens? Here you can clearly see the anti-scratch bar which fits inside, and the side panels. Both these things mean that, no matter how she might try, Miss Matilda cannot scratch grain out of the feeder onto the floor. Will it work for bantams? Well, my little Lemon Millefleur Sablepoot, Bono, thinks so! Here he is, taking his turn while one of my Light Sussex hens stands in line behind. 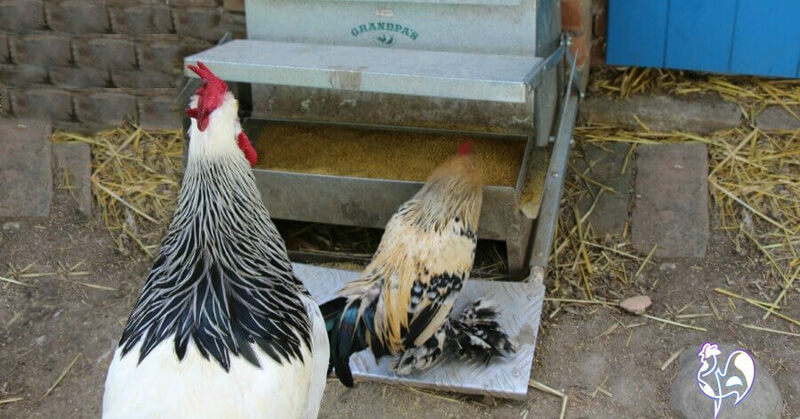 You may have to start by putting a weight on the treadle to help bantams open the lid. Bono originally waited until other hens were on the treadle and stepped up beside them, but eventually he got the hang of opening it by himself. What's to stop a rat or mouse standing on the treadle? Nothing. But the weight needed to open it is more than the weight of anything but a mega-mouse. And the hopper is far enough away from the platform that rodents couldn't get to the grain and keep their weight on the platform to hold the lid open. I've never seen any evidence that any rodent has managed to get inside this feeder. No droppings, no rat staring up at me - nothing. It's built like an anti-rodent Alcatraz. Will chickens be injured by it? This is probably the thing that most people ask me. The answer is "no". The chickens just move their head out of the way instinctively, before it closes on them. I've used this for over 5 years now with a flock of 20+ chickens. Not one of them has been hurt, not even when they use it to do acrobatics (yes, the hen inside the grain tray survived!). No chickens were harmed in the taking of this photo! Why Grandpa's as opposed to less expensive models? It's all in the quality. The materials and the design together make this a feeder to last. It's waterproof, there are no plastic or wooden parts for rodents to gnaw their way through. The manufacturers are so confident of the quality that they offer a two year "total satisfaction" guarantee. Money refunded, no questions asked. You really cannot say fairer than that. It's the best quality feeder on the market. It makes sure rodents and wild birds, both of which can bring disease to the flock, can't get access to your grain. It's waterproof, so prevents the grain becoming wet and growing damaging mould. It feeds the flock for several days (depending on the size of the flock of course) - great if you want to go away. 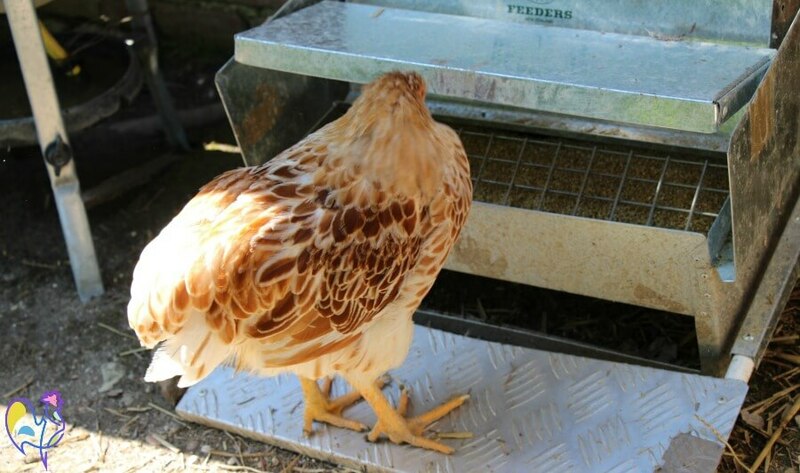 The opening is wide enough for even large-combed chickens to feed comfortably. The chickens learn how to use it very quickly. Miss Marple takes a sneaky snack before roosting time. Click to buy from Amazon (affiliate link). It's not cheap. But then, as I said earlier, you get what you pay for. I've had this feeder now for more than five years and it's showing no signs of wear. One Amazon reviewer reported: "Setup a video camera and found out that the squirrels were working together to open the feeder. I sent the video to the company. They sent me a refund." So, if you discover you have ninja-squirrels, the company will honour their guarantee. Fair deal, I'd say! Although, we have large black squirrels and I've never seen evidence of any in the feeder. Not exactly a drawback, but make sure you buy the right size. I have the small feeder. If I were buying again, I'd buy the large one for flocks of more than about 12 chickens. I bought mine in the days when I said "I'll just have maybe three or four chickens"... Now my flock has - ahem - grown a little, they tend to make a beeline for the feeder first thing in the morning, when it can get somewhat crowded. They do eventually calm down and share nicely, though! 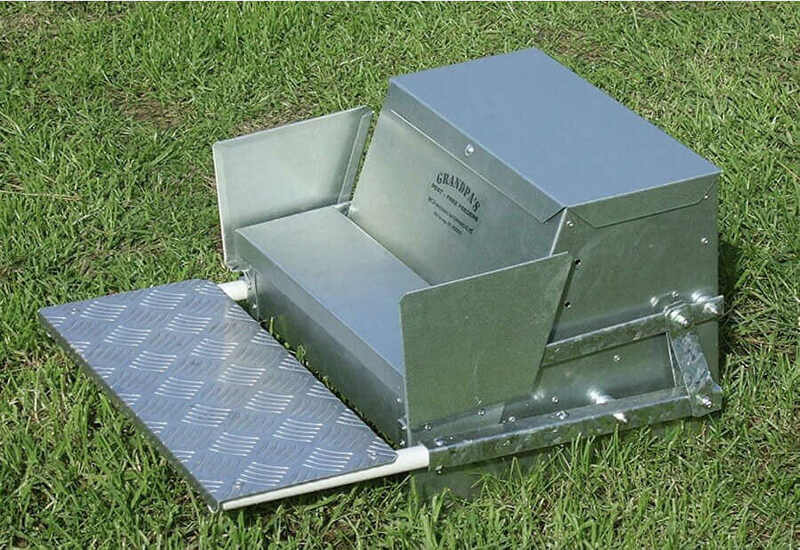 Yes, there are similarly-designed feeders on the market which cost less. But be careful. They're nothing like as well made. Grandpa's uses galvanised steel, while the imitations are Chinese imports using lightweight aluminium - cheap materials which won't last anything like as long. Take a look at their pictures and compare the mechanism with Grandpa's. The "alternative feeders" are not as well designed. The choice is yours, of course. If you really can't afford a Grandpa's, then they're better than nothing. In the long run, though, you get what you pay for. If you've read any of my other product reviews, you'll know that I have a "Golden Egg Award" where one egg means don't go near this product, and five means get out there now and buy it! I genuinely only recommend products that I have bought myself and love, or that someone I know and trust has and loves. In the case of Grandpa's feeders, I have no hesitation recommending. I love it. My flock loves it. That's good enough for me. 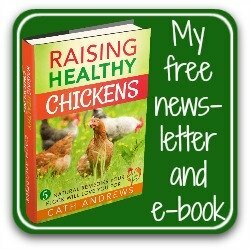 Want to know more about feeding your flock? Try these pages!